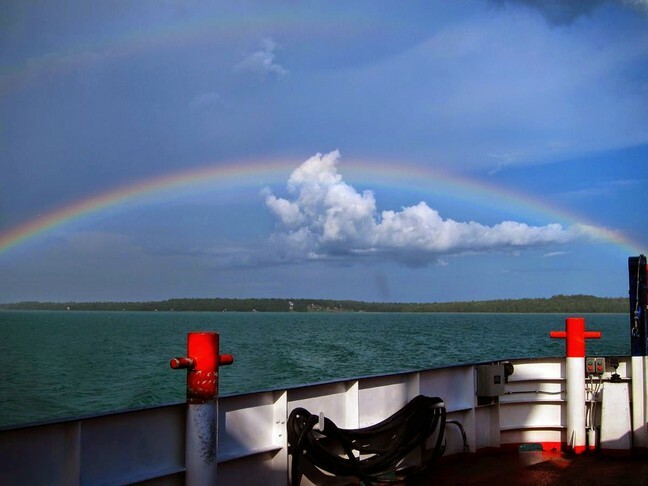 Every adventure begins and ends on the Drummond Island Ferry! Drummond Island is located at the eastern most tip of Michigan's Upper Pennisula at the far end of M-134 - just a short ferry trip across the St. Mary's that begins in DeTour Village. The Ferry Dock is easy to find - just follow the signs. When boarding the ferry at night the deckhands would prefer that you leave your vehicle headlights off. First, check the schedule for the boat so you can plan your travel times. Our Drummond Island Ferry runs on the 10s and 40s. There IS a line leader. They are the ones who got to the ferry dock first, line-up nicely behind them. Do not take cuts. In high season, ferry traffic will exceed capacity, particularly on Friday afternoons and Sunday mornings/early afternoons. 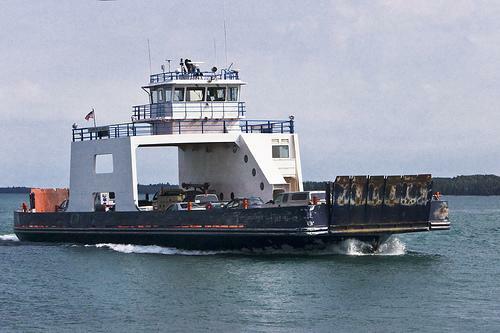 At these times the ferry may or may not “run wild” – meaning make extra trips between regularly scheduled runs to pick-up cars that were inline but simply couldn’t fit on-board. Be prepared to wait. Bring a book, a newspaper or a good friend to chat with! 4. Don’t rush – you won’t get there any faster. When getting on or off the ferry watch and wait to be directed by a Crew member. Rushing rarely accomplishes anything and may cause accidents. 5. Hang up – stop texting. When loading or unloading from the ferry please turn your cell phone off and pay attention. The process goes smoothly when we all work together. 6. Have your money or ticket ready. 7. Don’t argue with the Ferry Crew, ever. They are here to help us, they know what they are doing and do it well. Take time to smile and wave as you unload! 8. Sit back and enjoy the view!